Flowerama is known as the best flower shop in Reynoldsburg, OH. Located at the corner of Brice Rd and Main Street since 1990, Flowerama has won the Consumers Choice Award for florists six straight years and was voted Reynoldsburg's best florist. 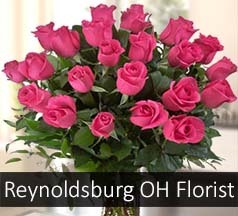 Flowerama offers same day flower delivery and same day express flower delivery to Reynoldsburg, Ohio. We always have three display coolers full of product ready to purchase so if you would rather stop in to the design center and select your arrangement yourself that option is readily available as well. We are a locally owned and operated flower shop and are considered experts in our field. So if you need Get Well flowers, Birthday Flowers, Anniversary Flowers, Sympathy Flowers or Just Because flowers delivered or picked up, Flowerama has you covered.